Our team is composed by experienced mountain guides, professionals who can introduce you to every aspect of this infinite passion that we share with our clients every day: the Mountain. Our company, based in Valsavarenche, Aosta Valley, is organized to help you discover the beauty of the mountains from Aosta Valley and beyond. Our Mountain Guides are organized daily, in summer and in winter, many activities, among which you must remember the climb and climb to the Gran Paradiso (4061 meters), one of the most majestic of the Alps 4000. 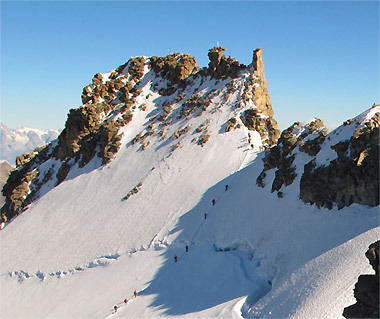 If you want to discover the mountains of Valle d'Aosta Rely on our Alpine Guides!